We had earlier reported that Yamaha had intentions of introducing its MT range of bikes in India as it saw potential in the ever-growing two-wheeler market. Moreover, since the commuter segment in India already had well-established players, the manufacturer was keen on shifting its focus to performance-oriented bikes over 150cc, an area where Yamaha really excels. Case in point being the R15 series. Using the capable R15 Version 3.0 as a base, the manufacturer explored the idea of a cross-platform bike, and that’s where the MT-15 comes in. 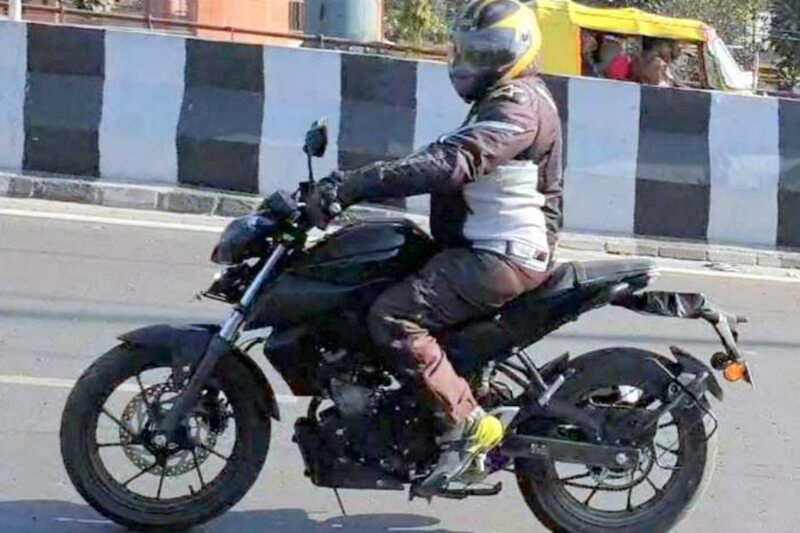 With few days remaining for the launch of the Yamaha FZ Version 3.0, a test mule of the MT-15 test has been spotted testing on Indian soil. On the design front, the 150cc street naked takes its styling cues from its elder sibling, the MT-09. It features an aggressive front fascia with a single projector headlamp flanked by LED DRLs. Pan to the mid-section and you see the chiselled fuel tank paired with tank extensions. The single, slightly stepped up seat and the stubby tail section is also reminiscent of the MT-09. Also, its all-digital instrument console is expected to be similar to the R15 Version 3.0. That said, the bike is essentially an R15 underneath as it shares the same underpinnings. A major difference in the India-spec MT-15 is the inclusion of a box swingarm as opposed to the aluminium unit seen on the R15. It draws power from the same 155cc, single-cylinder, liquid-cooled motor that dishes out a maximum of 19.3PS at 10,000rpm and 15Nm of torque at 8500rpm. It comes mated to a 6-speed transmission that also gets a slipper clutch. The engine features Variable Valve Action (VVA) which not only improves fuel efficiency but adds bottom and top-end grunt as well. Suspension duties are handled by conventional telescopic forks and a monoshock at the rear. Its braking setup consists of disc brakes at both ends and it’s likely to feature dual-channel ABS as well. Its 17-inch alloy wheels come wrapped in 100/80-section tyres at the front and a 140/70-section unit at the rear. With the kind of equipment at hand, we can expect the Yamaha MT-15 to be priced around Rs 1.2 lakh to Rs 1.3 lakh. When launched, it’ll go toe-to-toe with the recently launched KTM 125 Duke, which is priced at Rs 1.18 lakh (both prices, ex-showroom Delhi).